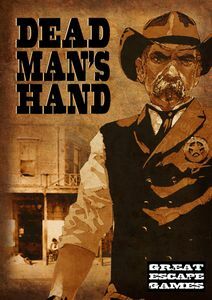 Over the past few weeks I have played numerous games of Dead Man’s Hand (DMH) (Great Escape Games, 2013), against both wargaming friends and others who do not play miniature gaming. I’m not giving AAR of individual games, but they were all fun and quick. The rules are nicely presented and illustrated, and they remind me strongly of other rules produced by Tomahawk Studios (Saga, Muskets & Tomahawks etc.) due to the use of character narrative boxes to clarify specific rules and ideas. The rule mechanics are simple and easily understood. There is not a great deal of depth; a pistol is a pistol, and not further distinguished by make (Colt vs Remington) or type (single action vs double action) etc., but I did not find this an issue. I was primarily searching for a fast paced, all action set of rules reflecting the ‘Hollywood’ style of game experience. I really like the use of initiative cards to determine turn order. I was initially concerned that the card reveal would give too much advanced knowledge to players, in contrast to the more disguised randomisation used in “Rules With No Name” (RWNN) which I had previously played. The ability to assign the first card drawn was also a good mechanic, giving a player some control over the initiative phase. In addition I was concerned that the small size of the cards would be an issue but after a game or two it became clear that the small card size was necessary to reduce table clutter. That said, the cards do result in table clutter, but I cannot see a way around this distraction. The ‘action’ phase (3 actions per turn) is simple. We often found that players ‘forgot’ to definitively state their actions before their move, which may cause dispute. I therefore made some order counters (dice) which players select prior to their move, and this worked well to define actions. Moving first (higher initiative) may seem best, but later players have the option to use ‘interruptions’ which can be very useful for survival. Interestingly everyone frequently used the ‘duck back’ option whilst the ‘quick shot’ was very rare, most players were not willing to sacrifice their total move for a single, simultaneous shot at an opponent. The movement tokens are another good idea, clearly tracking the move actions of individual figures. A great mechanic revolves around the dual use of the cards; as well as determining initiative, a number of cards are held in a player’s hand. Each card has a specific effect that can alter the actions of your own or opposing figures, and choosing when and where to play these cards is key. As well as generic cards (2-10), there are gang specific cards (J-A). As you only get a single replacement card, it is best not to play more than one card in a turn. No player used an identical card to cancel that of an opponent’s card in any of my games (not sure why, maybe just down to chance). Shooting is easily calculated by rolling a D20. A natural ‘1’ results in out of ammo, and a modified score of ‘19+’ is an out of action. The differences between pistol, repeater and rifle work well. Rifles are best at longer ranges and after taking a couple of actions aiming. Shotguns can be deadly a close range (I would have liked a sawed-off version included), and players usually let loose with both barrels if they can. The accumulation of ‘under fire’ markers is easier than tracking specific light/heavy wounds, but because they can be recovered it means that top characters with 5 hits can be hard to take down. These top characters usually need to be taken out by a single ‘19+’ score. The probability of ‘out of ammo’ (1/20) seems low considering most weapons have only 6 shots, but I can understand the game rational; it is a random event, players don’t need the book-keeping of tracking shots, and constantly running out of ammo would prove frustrating. Reloading (a single action) seems a bit too quick for me, and cover also seems too slight. At no point in any of the games I played was there any example of hand-to-hand fighting, so I cannot comment on these rules, but it appears to revolve around a simple comparative dice roll. No player ever resorted to riding horses (even though they were on table and available), so again I cannot comment on these rules. The ‘big nerve test’ gives a clear game end, which is useful, and relates to the number of characters down irrespective of level, so you cannot sacrifice your lower characters as cannon-fodder. The gang specific rules again add colour to the game. Remembering to enact these gang rules is one of the things a player needs to keep in mind, and I found I frequently had to remind non-gaming opponents to employ their unique rules. I used all 4 basic gang types in the games played and the specific rules were always useful and worked well. Rather surprisingly I don’t have a personal favourite gang yet! Most of the games played were simple stand-up fights, but I did play a couple of linked scene games given in the rulebook and these went OK, but I need to play more of these linked scenes before I can comment on them. When playing gamers I used 21 Rep point gangs (8-9 figures), but with non-gamers I used 12 Rep gangs (5-6 figures) lead by either a boss or right-hand leader, and I found these to work well and keep the game to less than an hour generally. So, my final thoughts on DMH: I really like them! They are fast and fun. I think they give as good a game as given by my previous favourite rules for the Wild West, RWNN, and they are certainly easier to explain to new gamers and non-gamers. I do have a few minor gripes: (1) No sawed-off shotguns (2) The out of ammo probability seems too low. Maybe introduce an increased probability for 2nd and 3rd shots in a turn (natural 1,2 for 2nd shots; and 1,2,3 for 3rd shots)? (3) Reloading is too easy and quick. Maybe introduce the need to pass a ‘nerve’ test to successfully reload? If fail, then a player can either insert a second reload order in their sequence (discarding their last action), or change the next order to reload. A character always succeeds if they carry out 3 successive reload actions. This would make reloading less certain and more time consuming in terms of actions expended. Top characters would be more likely to pass, whilst weak characters and those under fire, less likely. I have yet to try this out, but it is worth a thought.